Bulkheads are vertical retaining walls intended to hold soil in place, stabilizing a bank or shoreline. Replacements and repairs of bulkheads typically follow the existing grade and requirements of the original structure. To conform to regulation, bulkhead repairs, when complete, should be “in-kind” and “in-place” – that is, the repair does not alter the size, shape, or placement of the structure. Preferably, there should be little or no extension waterward (towards the water) from the existing structure. If you cannot avoid waterward expansion, you must consider the effect on the aquatic environment. 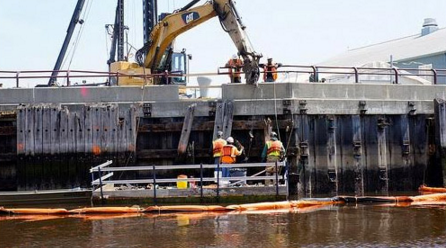 Army Corps generally allows the repair of existing, previously authorized, currently serviceable bulkheads under its Nationwide Permit #3 (“Maintenance”). A Nationwide Permit generally takes less time to process than a standard individual permit. Applicants planning a bulkhead repair project should first submit a Joint Application to the Army Corps so that reviewers can determine: a) whether your project meets the Nationwide Permit thresholds, or b) whether an individual permit is required. The easiest and most efficient path to obtaining a permit is the submission of an application for a project that is designed to be compatible with NYS DEC policies and land use regulations. NYS DEC has identified waterfront activities that conform to agency standards as Standard Activity Permits (SAPs). Bulkhead repair projects that involve and are limited to the removal of a lawfully existing, functional bulkhead and replacement with a similar structure in the exact location or landward of the former structure are compatible with agency (NYSDEC) policies and land use regulations, and are therefore classified for review as a Standard Activity Permit. Obtain or update an existing site conditions map or property/site survey of the property. See NYS DEC’s Drawing Checklist for Bulkhead Projects for recommended survey content. Prepare and submit a Joint Application with required NYS DEC materials. To find out what to include in the application, see NYS DEC’s Waterfront Activities Application Checklist. Note that application document and drawing requirements are the same for all bulkhead projects, regardless of SAP status. A NYC Waterfront Revitalization Program (WRP) consistency review is required only if a NYS DOS consistency review is also required (see above). The following are some specific application requirements for construction and maintenance of bulkhead structures.